The options for end of life care are becoming increasingly important to the ACT community. 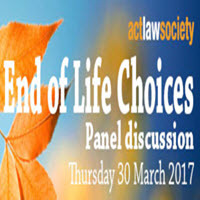 At this free event, hosted by the ACT Law Society and sponsored by the ANU College of Law, a panel of experts will examine the choices and decisions for palliative care currently available to residents of the ACT, and look ahead to the future of end of life care and the legal and medical implications of change. Continue reading"End of Life Choices – Event 30 March"
Frances Coombes, President of SAVES (South Australian Voluntary Euthanasia Society), spoke to the DWDACT November 2016 General Meeting about the process of making changes to legislation to allow people to access assistance to die. She presented a brief history of the drive for law reform in SA, and on giving advice on effective means of promoting such reform – persistence, engaging with the public, respectful dialogue and involvement in the political process. Continue reading"The South Australian Experience – Presentation"